Valentine’s Day is a day of love and appreciation, and I couldn’t think of a better way to celebrate then explain why my horse, Samurai, makes the best Valentine! He’s a great listener and always pretends to care about what I have to say; he even perks his ears up if I crinkle a peppermint wrapper! He’s honest with his feelings—he always let me know how he feels about work! He may throw me, but he’ll never dump me! He lets me choose all of his outfits so he always looks great. He’s always ready to lift me up when I’m down. He doesn’t steal the blankets at night. He gives the best kisses. And best of all, he loves me for me—he doesn’t care if I’m covered in dirt, if my hair is a mess, or if I smell like horse. I had the glorious pleasure to have a horse, my best friend ever . We were transferred and I had to arrange the sale of my horse .. I know not where he went and grieved profusely when the transfer was cancelled . I dreamed about him , haunted that he was in a violent thunderstorm and I couldn’t help him .. It’s been 40 years now and my love for him has only grown deeper .. I really enjoy seeing the horses and stories that you provide .. Thank you always for the pleasure I find in viewing your web site ! 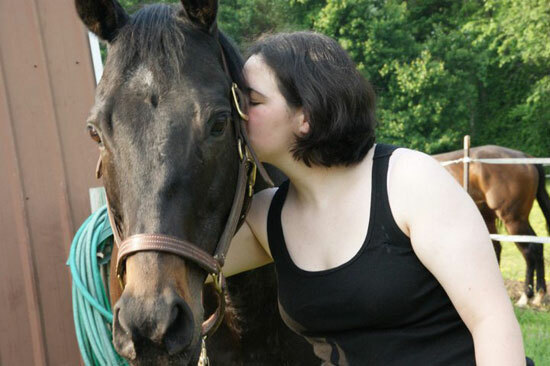 My horse loves me. . We could ride out in one direction and never come back. He blows his soft warm breath on my check, looks back at me, like ya I know your are up there, but I still have to look at you. He always happy to see me. I am also his best carrot person. I give him handfuls of them.